What an amazing honor to have been awarded the opportunity to travel to Belgium to collaborate on a new beer with an amazing brewery for one of the best beer weeks in the history of beer weeks: Philly Beer Week! Me and my co-workers at the brewery are so grateful to Global Beer Network and Philly Loves Beer, and I am personally over the moon about this because I love Belgium and Belgian beer. So each year, Global Beer Network partners with Philly Loves Beer to choose a brewery to make a collaboration beer with a Belgian brewery for Philly Beer Week. To do so, they have a raffle where the entries are submitted by beer lovers. The brewery and the person who entered the brewery into the raffle travel to Belgium for beer discovery, brewery tours, lots of frites and, of course, brewing beer … so cool! We are here with Nick Kilkenny, who had the good sense to throw our name into the hat along with a bunch of Philly beer legends to do all of that. Day One was a whirlwind! After a long day of travel and not really sleeping, I arrived in Brussels at about 7 in the morning. That gave me ample time to drink a bunch of coffee, pound a croissant or three, take in the Magritte Museum, get lost a few times and find my first cone of frites. It proved to be an amazing way to kill time before I could finally find a Gueuze Cantillon in front of me at Moeder Lambic, an amazing beer bar with two locations in Brussels. I followed that up with Mad Yeast‘s Saison Vignon which possessed a beautiful, soft brettanomyces character and smelled of chardonnay, pineapple and black peppercorn. It was all very memorable and an inspirational way to begin my beer journey. I met up with the rest of the group of 15 eager beer travellers, and we headed out for a quick pop and planning meeting. After adjourning, most headed over to Cantillon because it’s a must stop when in Brussels. 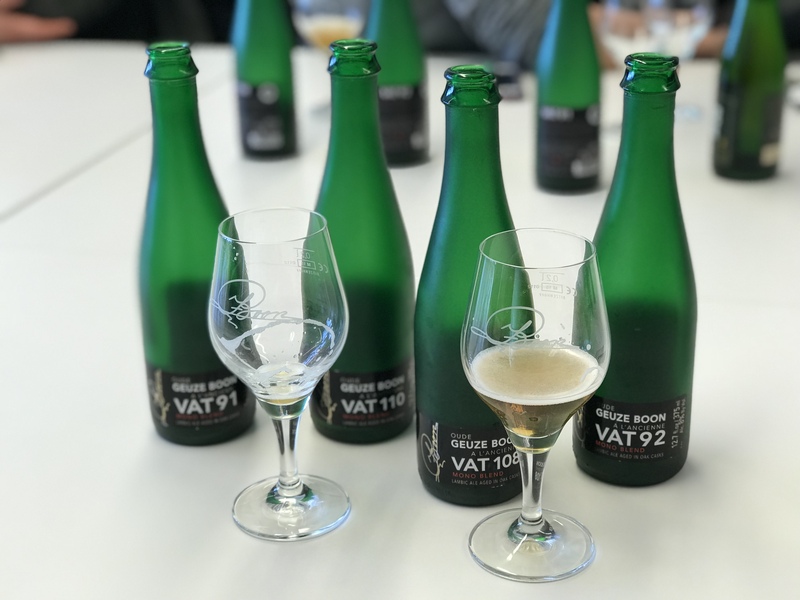 I was tempted by a trip to De La Senne where we were treated to beers, a tour and lots of stories by founder Yvan de Baets. The beers are impossibly thoughtful and delicious, and are a true reflection of Yvan’s vision. I especially loved tasting Bruxellensis Reserva. It was magic in a glass. Today, Day Two, has been really special. 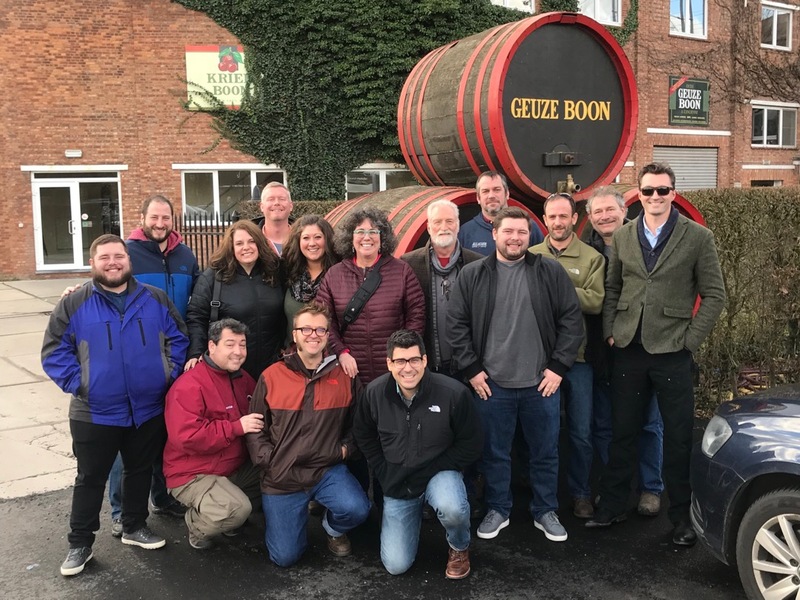 The whole group loaded up on a bus and headed to Brouwerij Boon who produce the Gueuze by which all others should be judged. The family operation founded by Frank Boon in 1975 as a Gueze blender. They officially started making beer in 1990 when they purchased equipment from a recently closed brewery at scrap pricing. The cast iron mash-tun from that brewery was built in 1835…yeah…that’s really old. In 2013, Boon installed a new brewhouse in order to keep up with demand and to be prepared for future growth. Fermentation of these beers is completely spontaneous, all of the wort spends time in the brewery’s single coolship where after the wort, naturally inoculated with 40 identified strains of yeast is transferred to one of hundreds of oak tanks or foeders for fermentation. The beers spend up to three years in the tanks for flavor maturation. The beers are blended, bottle-conditioned, aged for months and then finally released to be savored. During our tour, we were excited to have the opportunity to speak with Frank Boon who answered many of our questions. His passion for his craft is infectious and he is a true master. He settled one debate for us once and for all: the difference between lambic and gueuze. Lambic is the beer in the foeders which is without carbonation and is enjoyed as such. Gueuze is Lambic which has been bottled and has undergone a secondary fermentation in the bottle to create a lively carbonation. By law, Gueuze must be bottled to be labeled Gueuze. Lambic and Gueuze start as the same beer but ultimately become very different experiences when they are enjoyed. Frank’s goal for these beers is to create a balanced drink, which is refreshing and enjoyable. The beers are intended to be soft, dry, tart and sophisticated. Any sour, acetic character is considered a flaw and beers which possess this undesirable trait are not sold. All of the beers from Oud Gueuze to Mariage Parfait are excellent I will gladly drink them any time of day. It’s been a really amazing two days of learning while drinking. I’ve also been crushing my step count which is probably good considering the beer and all of the terrific frites and meats I’ve been plowing through. We’ve made our way to Bruges which will serve as our home base for the rest of our journey.